Keep it simple – Children get tired quickly, and they will need to rest more than you do. By trying to get your kids to do too much, you will probably end up with a few tantrums on your hands. Instead, keep things simple. Pace yourselves and ensure that there are always snacks available. After all, there is nothing worse than a tired and hungry child! 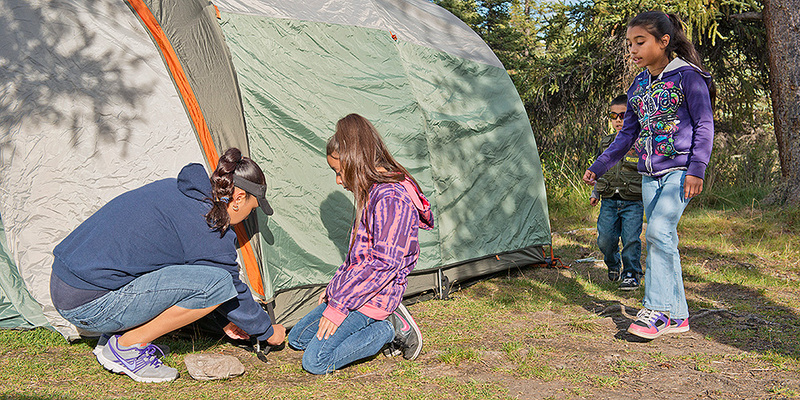 Build experiences – Camping is all about letting children explore and taking them away from their typical environment. You should see this as an opportunity to teach your children various skills. For example, you can show them how to identify various native animals and plants, as well as getting them to assist with camp chores, like collecting firewood. Try to limit their exposure to gadgets and their mobile phones while camping, as modern technology merely distracts from what camping is all about. Plan ahead – The importance of planning ahead cannot be underestimated. The vast majority of miserable camping scenarios can be avoided if you have prepared properly. The first thing you need to do is choose a camping site. Make sure you choose one that is popular with families. Once you have done this, you then need to get all of your equipment together. It is a good idea to make a list of all of the items you require. You can then check each item off as you are packing, ensuring you don’t forget anything. Of course, a tent should be the first thing on your list. Buying a Vango inflatable tent is a good idea, as they are much easier to put up than standard tents that come with fibreglass or steel poles. Also, you should buy high-quality sleep bags; the last thing you want is for your kids to complain that they want their bed! Stay safe – The most important thing to remember when it comes to any camping trip is to stay safe. Safety should be your main priority. Make sure people can see where they are going around your campsite – it needs to be well lit. You should also carry a well-stocked first aid kit with you, just encase any injuries or accidents occur while you are camping. Plan your meals – Last but not least, planning your meals is so important when you have kids with you. Of course, this can be extremely difficult when you don’t have cupboards or a fridge to choose from. However, if you plan beforehand, you will know exactly what to bring with you, and you can eliminate unnecessary weight from your rucksack in the process.